IBTM Barcelona, meet you there? If you’re in the MICE industry or Travel sector IBTM Barcelona is one of the mandatory events for you. Why? It’s simple. Every competitor of yours will be there trying to generate more business so why shouldn’t you? It’s a unique opportunity to connect with key players in these industries, therefore getting some competitive advantage. Moreover, it’s your shot to discover that new technology (like Planify) to optimize your work. 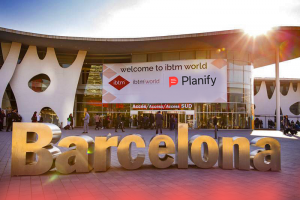 Which exhibitors can you find at IBTM Barcelona? The best surprises are usually between technology exhibitors! Yup! That’s not a myth. If you’re a regular Hosted Buyer you must know that sometimes the best surprises in this industry come from the most unexpected brands such as start-ups. In terms of technology, things have moved fast since these days, from planning and logistics to design and audience experience, you can find almost about any solution. Now, if you’re a Planner, you should know that it’s not possible to pronounce Planning without Planify. Group Travels Organizers, Incentive Travels Companies, DMC’s, Tourism Offices or Travel Agencies. These are our typical customers. We’ve changed the way these businesses work and we are now giving you the chance to do the same. To book a meeting with us it’s pretty easy. Just click the image below and you’ll be redirected to IBTM’s website where you can comfortably choose the best hour/day. Barcelona is a magical city, take time to explore a bit after the event and to get in touch with some key players in a more informal way. IBTM will take place from 28th of November to the 30th at FIRA (Av. Reina Mª Cristina, s/n 08004 Barcelona). Remember that business is about building relationships and therefore it’s also important to mingle with the community. Besides, if you do that, will see a completely different side of the event and it won’t seem like work at all.